Organize and store household goods, garage items, clothes, sporting goods, and more in the StoreWall Grab Bag – Medium. 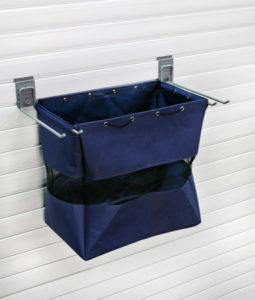 Made from a heavy duty tear-resistant canvas, the Medium Grab and Go Bag fastens onto Slatwall Panels with two 12 inch StoreWall Universal Hooks. Fits StoreWall, HandiWall, and standard 3 inch on center slatwall panels in which the slot goes straight in and straight up. Bag includes a mesh panel that goes all the way around for visibility and circulation. Available in two other sizes – Large Grab and Go Bags and Small Grab and Go Bags. Use in the garage, kids’ rooms, pantries, laundries, or any place you have slatwall installed.